How Fast Can You Type on Your PDA? The fastest entry in each of two categories won a Dom Perignon award. To know the answer, see the results of the Dom Perignon IV Speed Contest! FitalyStamp, FitalyVirtual, and Fitaly keyboards for Pocket PCs. MessagEase: an input method that is available on Palm devices and on Pocket PCs. Qwerty on-screen Keyboards for Palm devices such as the Tungsten T3 and the sony Clié, and for Pocket PCs. Palm Handwriting methods: Graffiti and Graffiti 2. Pocket PC handwriting methods: CalliGrapher and Decuma. Additional methods were invited in the original contest announcement. Obviously, the use of Graffiti shortcuts was not allowed and neither was the use of word or phrase completion capabilities such as the ones offered by Fitaly for the Pocket PC, WordComplete, TextPlus, or the one that is built-in Windows CE. The use of an attached (or built-in) full keyboard or thumboard was not allowed since the object of this contest was to compare input methods using pen input. The contest ended on November 7, 2004. The next 20 best entries were awarded a copy of FitalyStamp, FitalyVirtual, or the Pocket PC Fitaly. All participants made the demonstration that very fast text-entry is possible on a PDA! 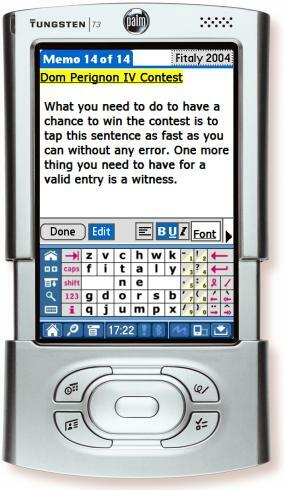 Contest entries have been recorded with the FitalyLetris freeware game, using either the Palm or the Pocket PC version. Times are measured in hundredths of seconds. Score sheets for all entries are available on the Dom Perignon IV Forum in the form of bitmaps attached to the entries. Below are the final results. The average speed is around 52 words per minute and it fully demonstrates that text input on a PDA is a very realistic proposal! Statistics By Method – The full statistics for all input methods. Hall of Fame – All entries over 60 wpm in the Dom Perignon contests. Quadratlon Corner – Some contenders submitted entries in up to four methods. Dom Perignon IV Forum – The full results, including score sheets. The average speed achieved by all participants in this contest is 52 wpm, which translates in an everyday speed of over 40 wpm. We would like to emphasize the significance of achieving 40 wpm and more on a PDA: This is the speed achieved by many average typists on the full 10-finger keyboard of a PC. So these results demonstrate that entering memos on a PDA is a realistic proposal with a soft keyboard such as Fitaly. In addition, these pen techniques only require the use of one hand, while the other hand can be used for other things such as holding a phone. Even for those who type very fast on a PC, the incremental speed is more than offset by the convenience of a machine that is always there with you, in your pocket, in every meeting, when you need to record a new idea, and always ready to start immediately. Carrying a laptop is not a convenient alternative, not to mention the time it takes to start a Windows application. And writing notes on paper is not a good alternative either with the time lost transcribing and the difficulty of filing paper notes. is to transfer from the PDA to the PC! The first Dom Perignon Contest took place in 1998, won by Marcus McRae at 65 wpm. Two years later in 2000, Dom Perignon II was won by Faith Perez of Australia, the first person to reach 80 wpm on a PDA. The 2002 Dom Perignon III was won by Jenneth Orantia, Jim Belich, and Patrick Yam. In this fourth contest an average speed of 52 wpm was reached. Moreover in all four contests, 42 participants scored over 60 wpm and 20 scored over 70 wpm. To allow an easier comparison with the earlier three contests, we chose to keep the same test paragraph. It turns out that the words used in it are among the most frequent in the English language and are therefore a good test for usual tapping skills. What you need to do to have a chance to win the contest is to tap this sentence as fast as you can without any error. One more thing you need to have for a valid entry is a witness. Click on to watch Dom Perignon award winners of the last three contests demonstrating their phenomenal technique.